Presented at First Baltic Conference on the Environmental Humanities and Social Sciences (BALTEHUMS), October 8-9, 2018, Riga, Latvia. 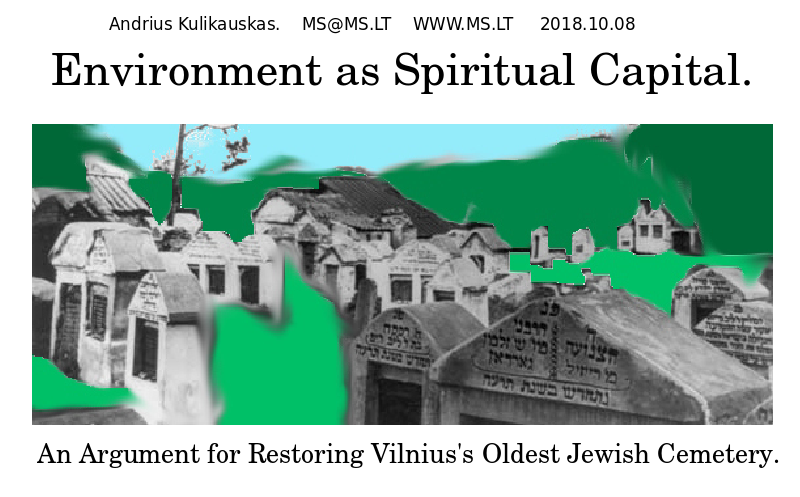 I wish to support the restoration of Vilnius's oldest Jewish cemetery as a symbol of empathy for Lithuania's Jews, the Litvaks, whom we lost to the Holocaust. In order to discuss the surprising obstacles, and how to overcome them, I will develop the concept of spiritual capital. First, in various ways I will distinguish spiritual capital and material capital. Then, I will discuss particular examples from Lithuania to consider what we need to know to make decisions about spiritual capital, how to recognize, measure, accumulate and utilize it. Capital is the inherent value in the accumulation of resources. For example, suppose that 1,000 Latvians each have 1,000 euros. Now suppose that they all lend that money to a single entity which now has 1,000,000 euros at its disposal. Then that entity can undertake many ventures, good or bad, which were previously impossible, such as build an apartment complex. That is material capital. And it is material to the extent that a single entity must control it all, as if it was wealth that had to be safeguarded in a certain place. Now suppose that 1,000 Latvians don't hand over their money to a single entity, but instead they share a vision. Suppose that they act independently, based on their own best judgement, but that overall, their wishes, values, actions and resources are in harmony. Then as a distributed network of independent agents they may be even more productive, for good or for bad. That is spiritual capital. Such a symphony of aspirations is evident in a cemetery which spans centuries. Spiritual capital is every miracle which become possible with freedom. An ecosystem arises only when each individual cares of its own accord. Money is an external motivator and so it can't get people to personally care. Money, as a single, unambiguous, explicit, external dimension cannot of itself generate the ambiguous, implicit and multi-dimensional solutions which may take the form of synergies, relationships, alliances, agreements and even contracts. 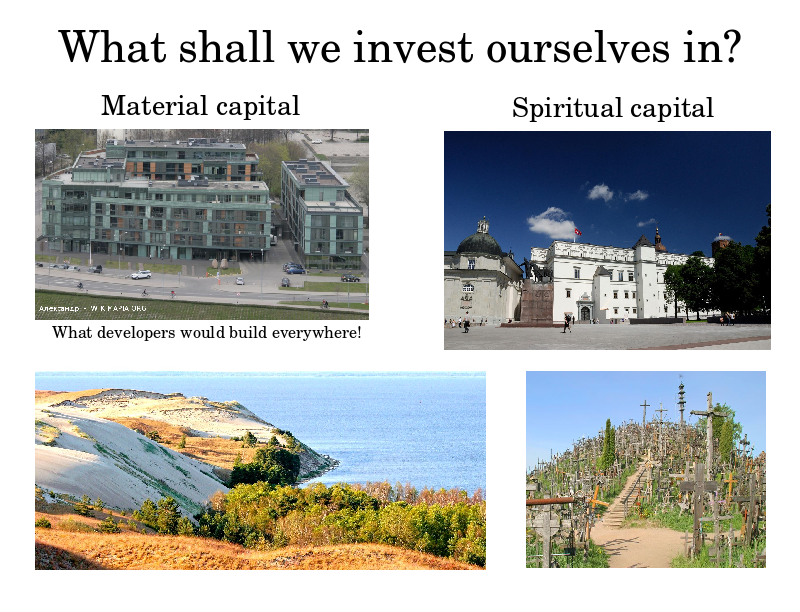 Capital takes on forms that we can invest ourselves in. Market pressures express investments in the form of material capital, such as an apartment complex, which can be converted into money. We as people link our personal values with tangible forms of spiritual capital that we can rally around. They include the public spaces where meetings were held during our Independence movements, or entire neighborhoods, such as our old towns, or even our homelands, our countries. Such spaces take decades or centuries for us to grow attached to. In Lithuania, examples include the Hill of Crosses, the Royal Palace, and the Curonian Spit. A crucial point is that spiritual capital has value even when it is taken away from us, profaned or obliterated, or when we are forced to leave it, because it persists in our hearts regardless, brings and holds us together, and ever sustains us. The Soviets bulldozed the Hill of Crosses but we kept erecting crosses. The Muscovites destroyed our Royal Palace in the 1650s but we recently rebuilt it. Of course, when spiritual capital is made tangible, then we can better appreciate it. The Royal Palace lets us see that the Renaissance was part of the history of Lithuania. Should we restore Vilnius's oldest Jewish cemetery, then we would better appreciate our Litvak community. In business, there are terms which refer to spiritual capital but only in terms of money. Natural resources considers living things not in their own right, but only in terms of their utility to people, and only if that can be monetized. Human capital turns people into money; social capital - relationships; corporate social responsibility - citizenship; and brand equity turns customers into money. Indeed, classical economics supposes that everything could and should be valued in terms of money. 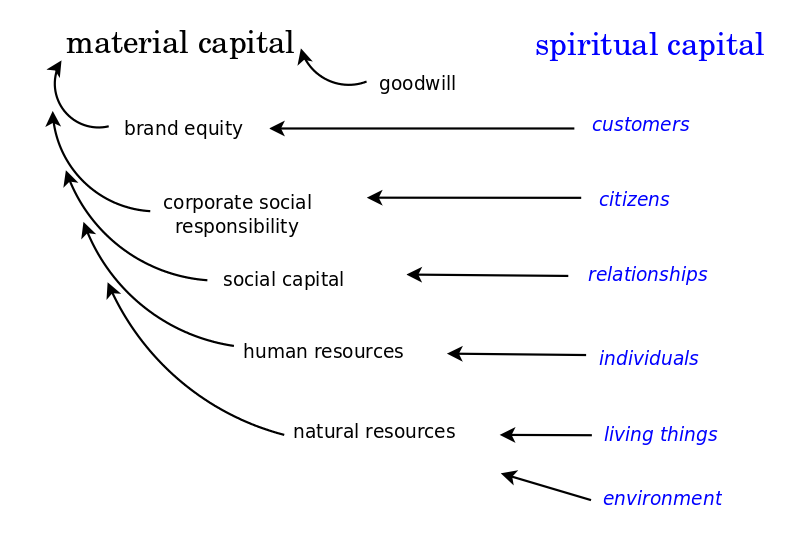 The term "Spiritual Capital" is I think best developed by business consultants Zohar and Marshall who wrote a book about it in 2004. They teach that we need to foster spiritual intelligence for a spiritual culture that appreciates the nature of spiritual capital. I like their principles of spiritual intelligence, which basically involve awareness of ourselves, of the big picture, and how we fit together. I think of that as considering our relationship with God as the spirit of the big picture. The theologian Baker describes spiritual capital as a community's potential for prosperity upon appreciating God as the source of life and our relationship as one of stewardship. Material culture and spiritual culture are grounded in the two minds which experimental psychologists Kahneman and Tversky spoke of as System 1 and System 2. A material culture of utility is based on our associative mind, System 1, which intuitively, unconsciously knows the answers. Spiritual culture leads us beyond the world of utility. It is based on our disassociative mind, System 2, which rationally, consciously does not know, but asks questions. When our unconscious, associative mind takes the lead, then we relate to things by having them, using them, controling them, and so we are inevitably motivated by fear, greed, power and ego, as Zohar and Marshall warn. When our conscious, disassociative takes the lead, then we let go of things, and let go of ourselves. We may let go of our needs by taking up the needs of another. Or we may at times simply be perfect and have no needs whatsoever. We consider a model where one's conscious mind invests in one's unconscious mind, which then later supports one's conscious mind. We may think of our unconscious minds as interlinked in a vast network which our conscious minds work to shape but must also work to resist. We can then think of "spiritual capital" as our investment in that cultural network and "spiritual economics" as describing our interactions with that network. The goal of a spiritual culture is to have our heart in the right place so that we live in terms of letting go and asking questions rather than controling things and having answers. In mathematics, we can show that our ability to let go of information is what distinguishes the mindset of the chooser from the mindset of the chosen. In the framework of the chooser, we keep track of what we choose but not what we don't choose. Consequently, the various things we don't choose are indistinguishable. This leads to an asymmetry between what we choose and what we don't. This is the subjective mindset of spiritual culture, where we let go of the many things we don't care about, and so we care about the few things we do. Spirituality is thus defined by what is immaterial, by what we don't care about. However, in the framework of the chosen, every choice is between this or that. Both options are always significant, always material. And so there is a symmetry between choosing this or choosing that. This is the objective mindset of material culture, which keeps track of everything, and makes expectations about everything. The upshot is that material culture forces us to choose between this or that. 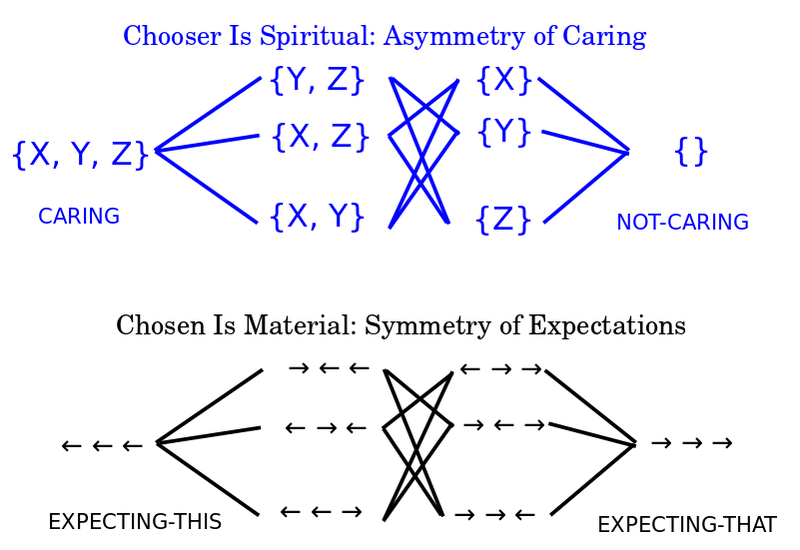 Spiritual culture lets us choose or not, so that when we do choose, we truly do care. Some things may have no utility and others may be useful for themselves. Whereas in material culture everything is explicitly framed in terms of utility, how it is useful for something else. Our emotional life is based on our expectations. 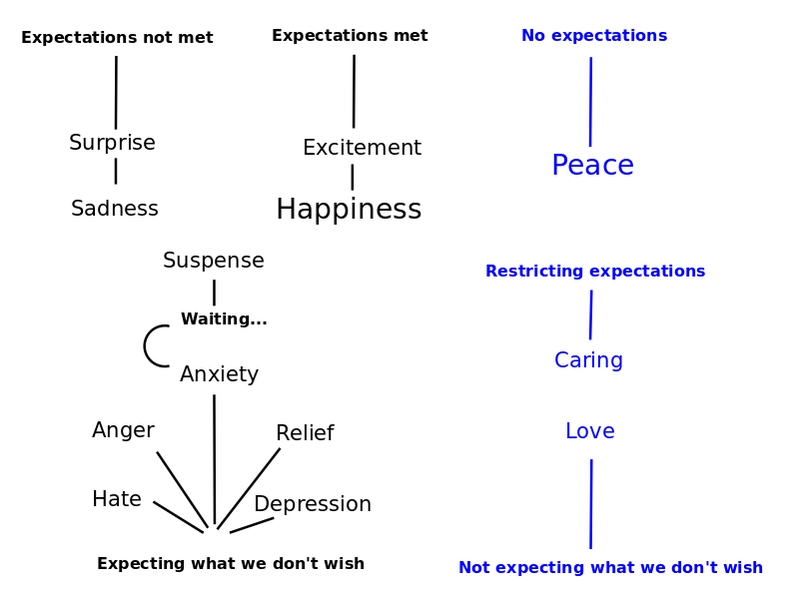 We are happy or excited when our expectations are met, and we are sad or surprised when they are not. We are in suspense when we are waiting for our expectations to be met or not. And we become anxious when we expect what we don't wish for, which then leads to feelings of hate, anger, relief and depression. Whereas we feel love when hate is impossible because we don't expect what we don't wish for. We are at peace when we don't have any expectations whatsoever. This leads to two very different strategies of life. Classical economics is based on maximizing happiness whereas spiritual economics is based on minimizing anxiety, thus feeling love and peace. Classical economics is driven by our unconscious mind, which seeks to have everything, makes expectations about everything, and makes us live in the external world, trapped in all manner of duties. This increases the likelihood that we will expect what we don't wish for. Spiritual economics is driven by our conscious mind, which seeks to let go of everything and do without. It has us internalize our duties so that we choose the ones that we will actually care about. Our emotional life is the way that our unconscious speaks to our conscious. In a spiritual culture, the conscious trains the unconscious to focus what it cares about on some deepest value which includes all of the other values. This deepest value will bring to light the questions which show where the unconscious mind's answers fall short. And these questions will further heighten the conscious mind. This leads to a spiritual culture that acknowledges our shortcomings and therefore allows us to learn forever, grow forever, live forever, here and now. Maximizing happiness and minimizing anxiety have a similar calculus and so they yield similar solutions to questions such as where to eat lunch. But these two strategies differ in regards to both the smallest matters and the biggest matters in life. This is because minimizing anxiety constrains our expectations but maximizing happiness does not. Maximizing happiness has us fight over the smallest advantages, such as being first in line. Minimizing anxiety gives way to others. Maximizing happiness also has the competitive market decide for us the big questions in life, such as what work we will do, what family we will have, and where we will live. Minimizing anxiety has us ignore the world in making our biggest decisions. The end result is that maximizing happiness yields an economy based on the external motivation of our expectations about the world, whereas minimizing anxiety yields an economy based on our internal motivations, what each of us personally cares about. First of all, nature is very tolerant of variation. A genetic flaw which increases the chance of mortality by 10% may yet propagate across ten generations. Second, nature consists of many niches, and so competition among species is for dominance within various niches, but generally does not lead to extinction. Third, nature tends towards an integrated unity, so that any species which disrupts the whole will suffer a backlash. The Royal Palace illustrates for us the dynamics of spiritual capital. It was built at the foot of the castle hill in Vilnius, which is at the confluence of two rivers. This prime location makes it a natural center among different regions, like a swirling eddy. It allows for a web of interactions, but it also invites cataclysms. The unexpected cycle of destruction and reconstruction reflects God's greater perspective and proves that the spiritual capital persists, regardless, in its ability to inspire us, and awaits the opportunity to become manifestly tangible. That inspiration typically grows in the bosom of an isolated dreamer, like the architect Napoleonas Kitkauskas, who was the creative mind ultimately responsible for reconstructing the Palace in accord with the historical evidence. He was blessed at the Castle Research Center "Lietuvos pilys" with a supportive team of archeologists and architects led by Director Vytautas Urbanavičius. This all became possible in the Gorbachev era. It also became legal to support such activity with financial contributions, to organize volunteers, and to get help from businesses. This endeavor was a symbol of Lithuania being free to care for its legendary heritage. In 1994, it was officially entrusted to the Ministry of Culture, and an architectural contest was held to make public the possibilities for the site. The financial crisis of 1998 saw the team work 17 months without wages. An encroachment by developers on a nearby city square, however, inspired a wider group of organizers and champions who reached out to the public through the Association "Pilis". In 1999, the Ministry of Culture's Commission concluded that the best way to preserve the foundations was to restore the Royal Palace. Indeed, the atmospheric threats to the foundations encouraged action. Recognizing the economic crisis and the government’s inability to fund research, well-known individuals from the clergy, the arts and sciences as well as public service established the Royal Palace Restoration Foundation on August 23, 2000. The World Lithuanian Community, which met in Vilnius at the time, encouraged Palace research and restoration and participated in the establishment of the Foundation. On October 17, 2000, Lithuania’s Parliament enacted the restoration of the Palace for Lithuania’s Millennium’s celebration as a goal into law. Thus it became a Government project with eventual financial support. In the summer of 2001, the Foundation set up a Pavilion - The Gates of the Royal Palace - and organized cultural events in the Palace cellars as well as Cathedral Square. 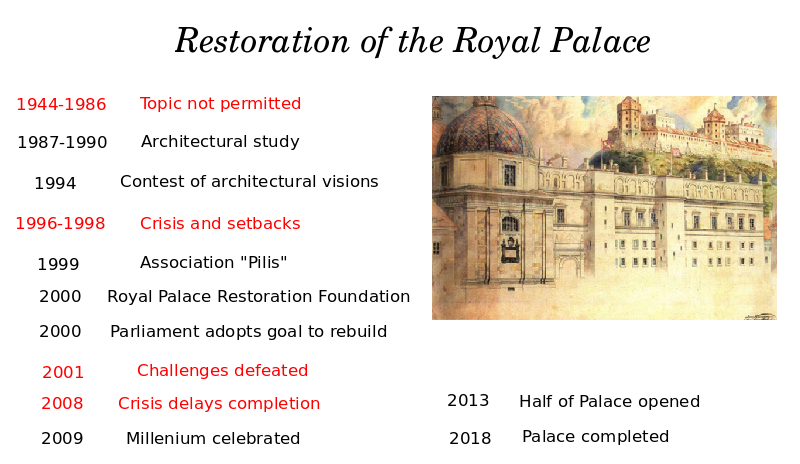 The Foundation and a sister organization, the Royal Palace Restoration Committee USA, promoted and publicized the Royal Palace restoration and raised funds by various means including commercial projects. In the fall of 2001, one political party of the new Parliament challenged the project on financial grounds, but supporters rebuffed this, and construction ensued. However, the economic crisis of 2008 limited the government's financial support. Only a formal opening of the Palace during the Millennium’s celebration was possible in 2009. Eventually, the National Museum Palace of the Grand Dukes of Lithuania opened in two parts in 2013 and in 2018. This progression shows how the restoration won an ever wider base of support. This pyramid of support, managing to integrate ever smaller but more numerous contributions, captures the value of the spiritual capital. Parallel to the divine swings in fortune was the very healthy dialogue amongst those for and against. Intellectuals were generally critical. They derided the restoration as inauthentic, and they wanted the money to go to other projects that looked to the future rather than the past. However, supporters appealed to the historical beauty of the Royal Palace and its value as a national symbol. A compelling argument was mathematical - money for the Royal Palace would not take away from other projects, but rather, if money could be found for the Royal Palace, then it could be found for other projects as well. In general, such dialogues clarify material convenience and spiritual transcendence. The fact that the Royal Palace was rebuilt suggests that Vilnius's oldest Jewish cemetery could be as well. 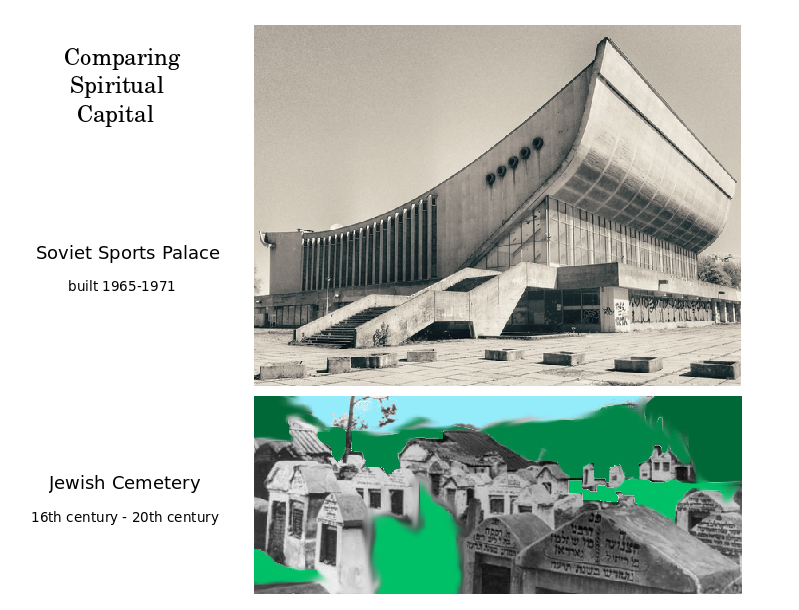 The Soviets desecrated the cemetery by building a Sports Palace on top of it. In 2005, a developer planned to replace the building with a giant new development. This was thwarted when the Heritage Registry deemed the Sports Palace an important example of Soviet Lithuanian architecture, as well as the historic site of the Reform Movement's Congress in 1988. The city of Vilnius then purchased the property with plans to restore it with European Union funds as a convention center. However, charges of corruption have twice delayed the project. Devout Lithuanian Jews and their supporters find it insensitive and hurtful that Lithuanians today would affirm the Soviet profanity and invite Europeans to make light of the Jewish fate. From the point of view of spiritual capital, it seems obvious that private and public developers will enshrine centuries of bad will. Clearly money would be saved by building a new convention center elsewhere. Why aren't Lithuanians taking the opportunity to show good will? Why do Lithuania's self-described patriots treasure Soviet heritage over Jewish heritage? This is the perverse result of how longstanding divisions in Lithuanian society have been patched over. Soviet Lithuanian architects are reinterpreted as the leaders of an anti-Soviet cultural resistance. Official Jewish community leaders accept some tokens of respect for which they agree to sanction the development project. 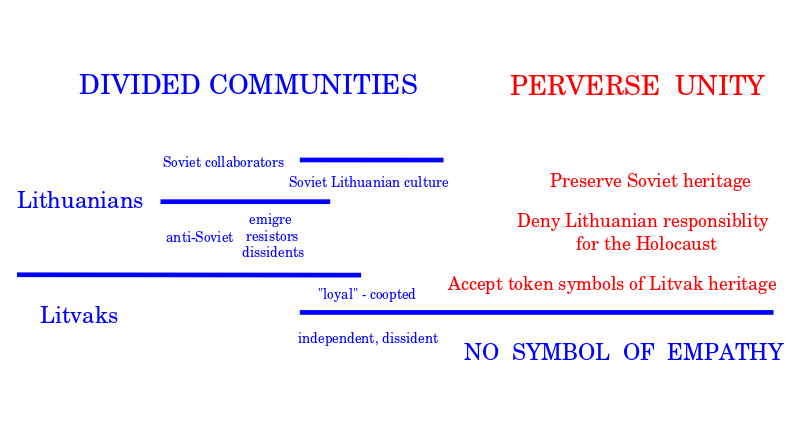 The root of the problem is that in 1941, Lithuanians and their leaders abused Lithuanian Jews, after having themselves been abused by Nazis and Soviets. Indeed, Lithuanian hero Kazys Škirpa concocted two persistent, injurious myths, that it was Jews who abused Lithuanians, and that Lithuanians retaliated. 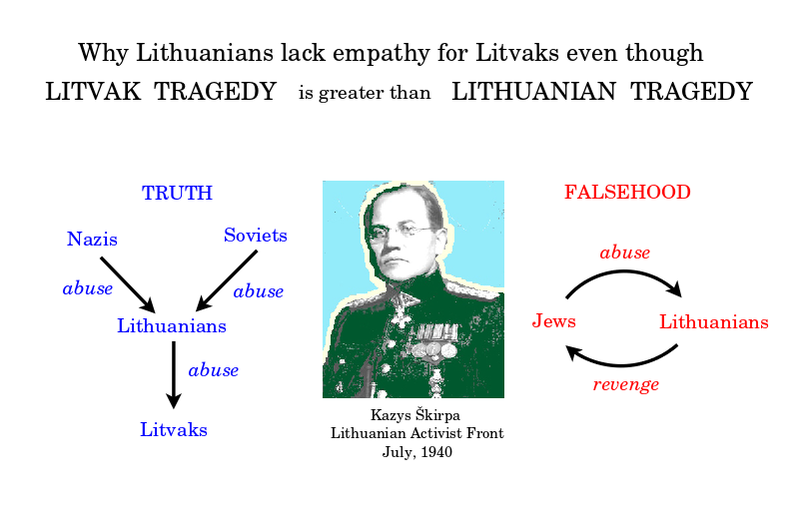 By this logic, Lithuanian Jews can expect no empathy from Lithuanians, who suffered, too. The key problem is a lack of dialogue. In Brezhnev's day, enthusiasts could not write about the Royal Palace because the topic was deemed nationalistic. Similarly, today, there are many truths that the Lithuania's press does not dare publish about Lithuanian accountability for the Holocaust. But it welcomes patriotic attacks on Jews and their supporters, as if they were Putin's agents. Such attacks are made by Lithuania's Genocide Center; by the Defense Correspondent Vaidas Saldžiūnas of the leading Internet portal Delfi's information war section; by Vidmantas Valiušaitis, the Director of the Adolfas Damušis Democratic Studies Center, named after a criminal against humanity who ended up in America; by the Union of Lithuanian Freedom Fighters, which identifies with genocidal Nazi collaborators; and by the patriotic Catholic youth portal Pro Patria, which thrives on divisive crusades. What is needed is thirty years of Litvak and Lithuanian dialogue, locally, nationally and globally. This depends on more divine intervention to stall development plans for the Sports Palace. 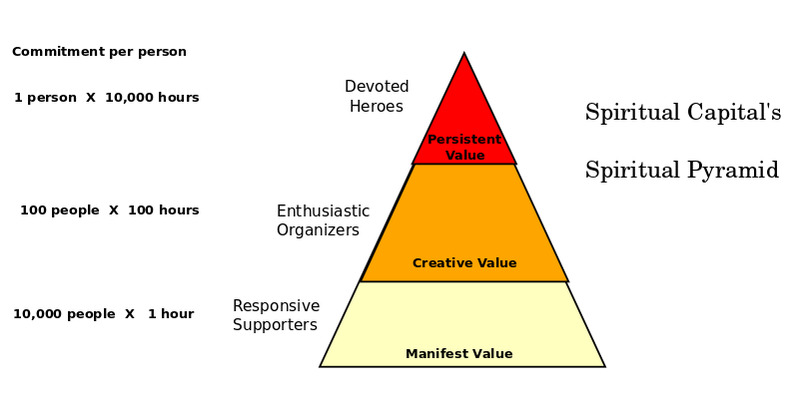 As with the Royal Palace, there needs to be a growing pyramid of supporters. Shnayer Leiman is the professor with the knowledge and devotion to reconstruct the cemetery. Dovid Katz is the organizer who leads a chorus of international opposition. But now we need a crosscultural association of enthusiasts to reach out to the public with activities, as Julius Norvila has with his art projects. Such true fans are the distingushing levels of the spiritual pyramid, for they generate internal variety and dialogue, which material economics tries to cut out as unnecessary. As the issue becomes known, the spiritual pyramid expands to include those who can contribute 100 hours of support, or perhaps 10 hours, or perhaps just an hour. The manifest value of the spiritual capital is its ability to include those who care just a little, perhaps enough to buy a box of chocolates. In the case of the Royal Palace, some 500,000 boxes of Ruta chocolates were sold, contributing 1 litas each to the effort. Spiritual capital can thus be measured in terms of its creative value, given by the organizers in its middle levels, and also in terms of its manifest value, given by its widest base, all those who respond. These values can be measured approximately by the hours contributed. I conclude by summarizing the value of spiritual capital. It accumulates what we are willing to give up, what we are willing to sacrifice. It shows that we care - and you can't pay u to care. It is a shared purpose that integrates our different values. It helps us accept the truth. It facilitates our alignment but also lets us include others. It creates a supportive microcosm, which is not "self-organized", but rather gives us the freedom to organize. It is a place of peace which lets us sense our emotions, share them and amplify them. It lets us be triggered at different levels of commitment. It is a rallying space in case of emergency, which persists even if it is destroyed, and may yet rise again. It is we. Moderator: I am quite skeptical about many things you said about the two minds, which then shifted into talking about the conscious and the unconscious minds, which brings up very different ethical outlooks than before. I object also to what you said about nature and how it always tends to towards a wholeness. I would have to be critical about that very condensed metaphysics. And I don't really see why it is necessary to make an argument for the restoration of the Jewish cemetery. I would rather be interested to see some of the details of that possible project, the restoration of the possible cemetery, what you imagine when you talk about restoration. For example, should it be a restoration of all of the individuals' graves with the names inscribed on them or more of an abstract memorial? Andrius: So those are the three questions that you are interested in? Moderator: Yes, more or less. Andrius: What I am trying to speak from is not a fantasy but from reality. The reality is that that Sports Palace will be built. And the reality is that nobody really cares. And the reality is that the Lithuanian press won't even speak about it. So there is a petition which has been signed by 44,000 Lithuanian Jews around the world, which is amazing because that is more Jews than have ever connected to an issue after the Holocaust. This is a population which, as you know, was reduced from 200,000 people to a few thousand. So it is absolutely sick, first of all, that this issue can't even be brought up in Lithuania, for whatever reason. That's a sickness of the society. The second thing regarding that is that it would be very valuable for Lithuanians to appreciate the Lithuanian Jewish community. In the Jewish world, the Lithuanian Jews are considered the most cool of all the Jews. If you look at the Nobel prize winners among Lithuanian Jews, it's just amazing, there's at least seven of them. No Lithuanians have ever won the Nobel Prize. And these are poor Jews who came from Lithuania. Vilnius was 40% Jewish. If Vilnius was 40% Jewish today, it would be the most important city in Eastern Europe, and no Lithuanians would lack for work in Vilnius, and we would not have had a million people leave. We would not have fewer people in Lithuania. So the fact that Lithuanians have no interest in these Jews, who really expand the concept of Lithuania... The Jews preserved the heritage of the Grand Duchy. Lithuanian Jews don't think of ethnic Lithuania. They think of the Grand Duchy of Lithuania because they were very happy there. That includes Latvia and that includes Belarus and that includes a lot. That's what they think Lithuania is because they relate to that culture. And we're peasant people. We are detached from that culture. Our history could be recovered through the Jews. This is a huge asset. And the smallest little symbol to say, "We're sorry you aren't here." Just like we're sorry the Prussians aren't here, we're sorry the Jotvingians aren't here. "We're sorry, we miss you." And it would not cost anything. It would be cheaper to build this elsewhere. So all of these show this sickness. When you look at the reality and you compare it to the Royal Palace. This idea of having your fantasy and saying what it is going to look like... It doesn't really matter. Let there be many organizers with many visions. We have to come to that point, it doesnt' really matter. But what's possible and what I show here - this is a real photograph. Many many photographs of this. It could be rebuilt. Those inscriptions are known. Just as much as the Royal Palace. It's known better than the Royal Palace. It's much more better documented than the Royal Palace. So to answer your first question, it's not about what I think should be there. It's about what whoever thinks. It's about having a dialogue of many views. We're not there yet. We need to have that. Regarding the two minds, we have a mind that's just associative and whatever stupid things... Like, it thinks it knows. That's like the yin mind. I was in China and gave a talk on the yin and the yang and they were very supportive, in China, at the World Congress of Philosophy. Basically, the mind that should be in charge is the mind that says No! Don't...! I gave a talk on the Dao. What the Dao De Jing says is that "the way that suggests itself is not often the right way", "the word, the name that suggests itself is not often the right word". The stupid things your mind tells you are not often the thing. Don't listen to your mind, don't go the easy way, cut, cut, cut yourself off from other people. Be an independent thinker. That is the right relationship between the yang and the yin. 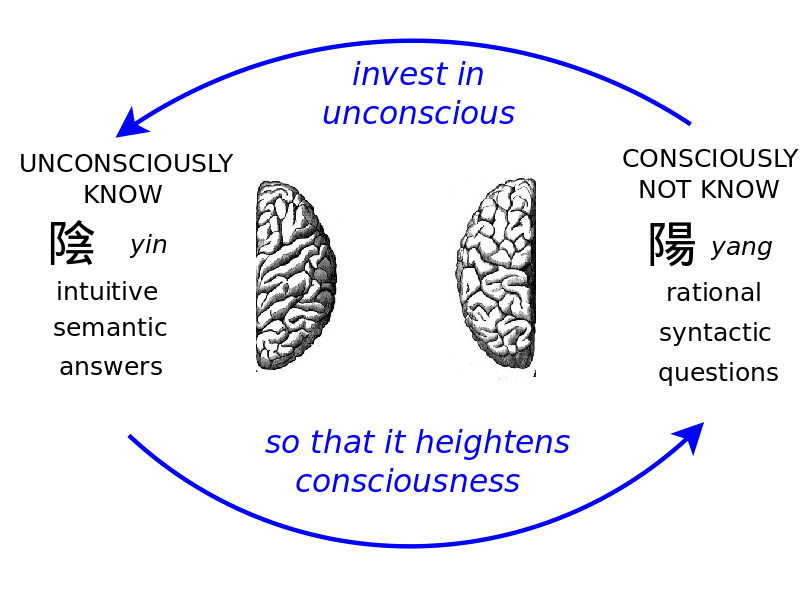 The yang mind needs to be in control and then it creates an environment where the unconscious mind can figure it all out, size it up and report back with emotion. We can disagree about that. From a Chinese point of view, they agreed that, yes, it's been mistranslated for two thousand years. That was the conclusion from the experts of the Dao De Jing. And then the third point that you made was about nature. I would say, what is very interesting, if you look at the evidence for the embodied mind, which is very inspiring - Lakoff talks about the embodied mind. All of the same evidence can be used for the disembodying mind. The mind is trying to run away from the body. And if you look at evolution, the principal fact about evolution is that the central nervous system is moving towards abstraction. So like a paramecium touches the world directly. But a butterfly doesn't live in the world directly. A butterfly has a nervous system. It lives in a world of icons, of pictures, it sees, it lives in a world of flowers. It pays attention to it. A butterfly pays attention. But a mouse doesn't just pay attention. A mouse is aware, has a model of its attention. A mouse can know, "Oh, I'm paying attention to attention to that cat. But is that cat paying attention to me or not?" It lives in a very abstract world of indices. An orangutang is able to be conscious because an orangutang is able to step into its attention, and step out, and choose. "Do I want to pay attention or not? Do I want to ignore you or not?" It's able to take its global workspace, abstractly divide it into two perspectives like free will and fate, opposites coexist, this may or may not be, but if it exists, then it exists. So we live in a very abstract world of parameters that say, "I should be more liberal. I should be more conservative. I should do this." And it all gets automatically happening by the stupid mind that makes it automatic. The point there is that all of nature is tending towards an abstract unity. Number one. And then when we look at competition, any species that tries to... What will happen with climate change? Nature's gonna kick... you can see... It's kicking back. It's saying, "Look! You're not in charge here. You try to be in charge, you're going to be slammed and slammed and slammed and slammed. You're going to be put into place. Because there's four billion years of evolution that has brought the kind of integrated harmony where you have to sit in place." So those are my answers to your points. Thank you to Edmundas Kulikauskas for answering my questions about the restoration of the Royal Palace. Thank you to Defending History and its editor Dovid Katz for documenting the recent history of Vilnius's oldest Jewish cemetery. Thank you also to 15min.lt reporter Ugnis Antanavičius for his reporting on this issue.